My name is Mona Fairless. I initially started a business in my home called Kountry Kookin. Back in the early 2000's, a girlfriend and I started making homemade salsa (it's a secret recipe). We held sales at Christmas and from the response to our salsa, we started adding other things like pepper jelly, antipasto and giftware. I was a stay-at-home mom who liked to volunteer with my child's school and other activities. This was something that I could do from home but still have the flexibility to do the other things that I loved to do. In 2006, I opened my store, Kountry Korner Gifts, at Jackfish Lake, Alberta. This little store was on the lakefront and by appointment only. Sometimes, I would open for special events and holidays. In 2009, my only son graduated from high school and I was looking for something to fill my additional time. I first started working part-time job outside of the home but soon felt the urge to expand my store and move it into a small town. I was looking at Spruce Grove or Stony Plain as both towns were only 20-25 minutes from my home. I have volunteered for many years with the Friendship Committee for the Japanese twinning of Stony Plain and Shikaoi, Japan. I was given the opportunity to travel to Japan with some of Stony Plain's Town Council members and other people in the community. Connecting with this unique group of people made my decision to move to their community easy. On June 1, 2010, I sub-leased some space with a teahouse and then in October, I expanded to the whole building, where we are currently located. I am a firm believer that everything happens for a reason. 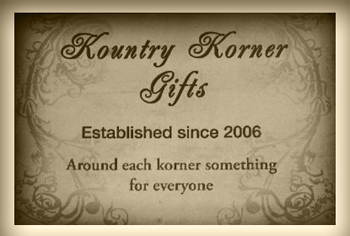 Kountry Korner Gifts has a unique motto, "Around Each Korner Something for Everyone." I am so lucky to have a great group of girls working at my gift and novelty store. Our business concept is to keep the prices down enabling us to bring in new stuff all of the time. Our staff do great job in keeping this store running like a well-tuned vehicle. We pride ourselves on being UNIQUE and passing savings on to our customers. We are here to stay and responses from customers have been very positive. They are always saying, "I will be back when I have more time." Even husbands enjoy shopping at our store because there is something for everyone. We look forward to a long time in this beautiful town of Stony Plain, Alberta. Whether you are shopping for kitchen items, home decor, baby gifts, bath & body soaps and lotions, Canadian or Stony Plain souvenirs, seasonal items, rustic cabin decor or scrapbooking supplies, our store has it all. Check out our new items and clearance items which are continually changing.